Which came first: Galaxies <=> Stars <=> Planets? If a galaxy is defined as a collection of planetary systems (and all matter in between), and a planetary system is defined as a collection of planets circling a star (and all matter in between), and a planet (and other smaller bodies, like asteroids, moonlets, moons, etc) is basically just a very very, very large collection of minerals, stardust and gases (which make up the entire universe), which came first: The planets, planetary systems or galaxies? I've been given to understand the universe came first...but after that? I thought I understood, at least the layman's basics, of the universe formation. However, today, I’m having trouble conceptualising the order in which they would have been formed, IF they are defined by the smaller unit. Is this just me getting the semantics of classification and the actual chronology of each feature forming, mixed up? The universe is made up of a complex mix of everything (matter, antimatter, darkmatter, to name just a few), and expanding 'space'. A very, very, large area of 'space' is covered in very, very, tiny particles: made up of at first gases and later 'stardust'. A galaxy is formed of gravity-attracted gases, and after the very first stars went supernova and exploded there was also 'stardust', which combines to create 'clumps' of interstellar clouds (cloud nebulae). The cloud nebulae are the 'nursery' areas for star formation (both initial stars and later generation stars). The newly created star uses remnants of 'stardust' in the cloud nebulae to form planetary systems and then, a 'short' time later the orbiting planets (and other sized objects). Universe (Largest scale) => gases (very small scale) => galaxy => interstellar clouds => stars => planets (combined to form planetary systems). And the tiny particles of gases and 'stardust', are involved in nearly all scales. Just writing out this question has helped! I hope you don't mind me posting it anyway, as it might help others and I still need confirmation that I have, hopefully, worked myself out of my conundrum (not deeper). The structure we see in the Universe has formed from the gravitational collapse of the matter that was once an almost smooth density field of gas ("baryons") and dark matter$^1$. The word "almost" is important here, for if it had been completely — or even non-completely but much more — smooth, then the collapse would not have had the time to happen before the expansion of space has diluted the matter enough to prevent any collapse, and we would never had come into existence. An overdensity is denoted by $\delta\equiv\rho/\langle\rho\rangle - 1$, where $\rho$ is the density of the overdensity and $\langle\rho\rangle$ is the average density. The evolution of overdensities under the force of gravity can be calculated exactly for $\delta \ll 1$ using linear perturbation theory, but when $\delta$ becomes of order unity, the non-linear regime is entered, and severe approximations must be made, so one turns instead to numerical simulations. It turns out that if $\delta\gtrsim1.68$ (i.e. if a region in space has a density which is 2.68 times the ambient density), it will collapse. The answer to your question is then given by what size of clumps first reach $\delta\gtrsim1.68$. Primordial quantum fluctuations$^2$ grew in size during the (admittedly still pretty blurry) inflation, a fraction of a second after Big Bang. In the young Universe dark energy was negligible, and the dynamics of the Universe was dominated by matter. Because dark matter comprises $\sim5/6$ of the total amount, we can initially neglect the presence of gas, but when the density becomes very high, gas pressure builds up and counteracts the collapse. The overdensities amplified as matter started to collapse. It turns out that the density fluctuations are larger for smaller scales, so the smaller the clump, the sooner it will collapse. This results in the so-called "bottom-up" formation of structure, which is in contrast to what was originally thought; namely that galaxies formed "top-down" in a monolithic collapse (Eggen, Lynden-Bell, & Sandage 1962). However, this approach neglects both gas and the motion of dark matter particles (treating it as so-called cold dark matter). Taking into account the effects of this puts a lower threshold for the masses of the structures of $\sim10^5$-$10^6M_\odot$ (e.g. Naoz et al. 2006; Yoshida 2009). Hence the first structures that formed are believed to be minihalos roughly the mass of globular clusters. Stars consist of collapsed gas and almost no dark matter, and the formation of a star thus needs the theory of hydrodynamics rather than just gravity. In order for matter to collapse to such dense structures as stars, it must get rid of much of its energy. This is not possible for the collisionless dark matter (at least in the normal sense, but this post), but gas, which can collide and cool by radiating, is able to do so$^3$. Through radiative cooling, the minihalos thus fragmented further into first gas clouds and then the first stars when the Universe was a few 100 million years old. Subsequently conglomerations of stars merged into galaxies, which eventually formed sheets, filaments and clusters of galaxies. The first stars were formed out of pure hydrogen and helium (and small amounts of lithium), and the material for making planets did not exist. But when these stars — which were very massive — exploded as supernovae and polluted the interstellar medium with metals$^4$ and stardust$^5$, the formation of less massive stars became possible$^6$. Dust particles stick together to form pebbles, rocks, and planets. Planet formation is probably not possible for too massive stars$^7$, but with the formation of small stars this became possible. However, note that the merging of minihalos to larger "galaxies" (without a significant amount of stars) also may happen at earlier epochs, and in particular that star formation (and dust and planets) is a continuous process which still takes place today (although the bulk of the star formation took place when the Universe approximately 3–6 billion years old (Madau et al. 1998)). $^1$And radiation, which actually dominated the energy density until the Universe was $\sim50\,000$ years old. $^2$The term primordial quantum fluctuations might be the coolest term in physics. $^3$There are hypotheses of so-called dark stars, but that's beyond the scope of this text (primarily because I don't understand them). $^4$For an astronomer, the term metal means any element heavier than helium. It's easier this way. $^5$Astronomers just call it "dust", and use only the term stardust when talking to non-astronomers, in order for them not to fall asleep. $^6$The reason is that with the many possible electronic transitions of metals, the gas has more ways to cool, and hence may collapse at earlier times, before the proto-star clump reaches high masses. $^7$Because the high radiation pressure of very massive stars blows away and/or destroys the dust (I think, but this is not my expertise). The short answer is we don't know. A longer pedantic answer would point out that use of a term without understanding what you mean by that term is never appropriate. The term I feel is problematical is "stardust". In our standard picture of big bang nucleosynthesis, we are optimistic (because of the good agreement between calculations and observations of cosmological abundances) that we understand that as the Universe cooled hydrogen, helium, and traces of other elements formed (lithium is the one most often mentioned). It is almost NEVER pointed out that if the Universe is composed of 27% dark matter and only 5% regular matter (mostly hydrogen) then these calculations are an abysmal failure: they don't predict the existence of dark matter! All this is ignored and we congratulate ourselves (or rather the popular media lionize science's "accomplishments"). You can't ignore most of the matter in the Universe and expect that your models will be accurate. Whether the first star preceded or followed the first galaxy is to some extent a matter of definition. To some extent. It isn't at all clear whether or not any black holes existed prior to galaxy/star formation. If super black holes existed, then anything within their gravitational range would comprise a galaxy (if you chose to use a reasonable definition of galaxy). What would exist then would be gas (and plasma), dark matter, and the beginning traces of what you'd probably say is stardust: the lithium, boron, etc. which would agglomerate as it collided with similar atoms. The density of this dust would be far too low, I think, to ever form planets without other objects gravity intervening. (Although I probably should never say never). OTOH, if the only black holes existing were sufficiently small, they'd probably evaporate with only transient effects on the particle dynamics. So, we can ignore stardust, most of that was formed IN the first (Generation III) stars. The question is: which came first; galaxies or stars? And the answer is: what exactly defines a galaxy? We believe there were density fluctuations which would lead to gravitational collapse of the gas surrounding them (and composing them). At what point does this motion qualify as being distinguishable from other motions (other volumes of collapse)? Perhaps you can guess that it will depend on both the dark matter present AND the velocity (temperature) of the gas. A careful analysis would probably involve escape velocities (and as you probably know, that depends on the dark matter distribution) and the point at which "most" gas was orbiting rather than just randomly colliding which would in turn rest on what "most" means (51%, 90%, 99%,...). So define the term galaxy. If you define it in terms of stars, then the answer is easy: (some) stars came first. If you define it in terms of zones of gravitation, then it is possible that the answer is both. That is, in some cases hydrogen had enough time to collapse into a star before "most" gas was bound to a near by "galaxy" (probably proto-galaxy would be a better term here) and in other places the protogalaxy had defined itself before the first star lit up. We don't know. 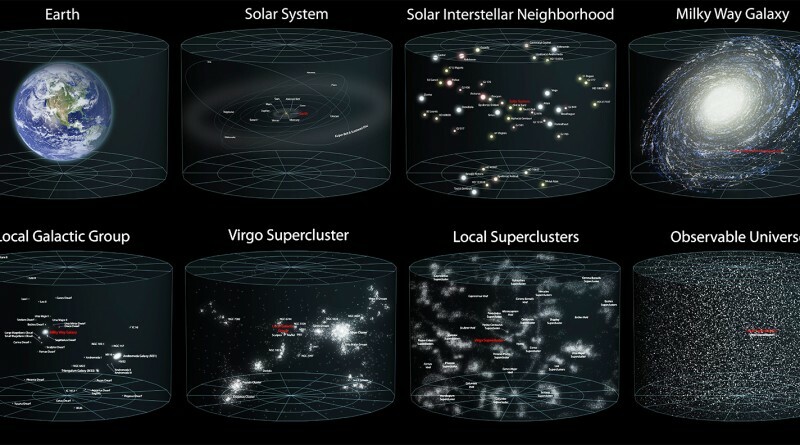 It is a mistake to assume that the Universe as we see it today is a reasonable approximation of the Universe as it would appear only 10 or 100 million years after the big bang. Our models aren't good enough yet (and probably won't be until we understand a lot more about what dark matter is and how it behaves) to be confident that protogalaxies existed before the first stars or that the first stars lit up before the zones I'm calling protogalaxies were separate systems. Not the answer you're looking for? Browse other questions tagged cosmology fundamental-astronomy or ask your own question. Was the progress of astronomy in the 1800s surprisingly slow, and if so why? How did the reionization epoch make the universe “transparent”? Why is dark energy preferred to the cosmological constant? What is the effect of the axial precession on the orientation of the planet's orbits?